Size of this preview: 800 × 580 pixels. Other resolutions: 320 × 232 pixels | 640 × 464 pixels | 1,024 × 742 pixels | 1,280 × 928 pixels | 2,000 × 1,450 pixels. 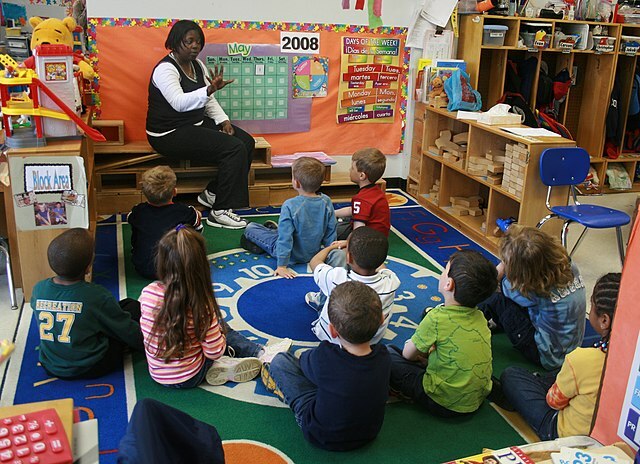 Español: Teacher teaching students in an early childhood setting. This image was originally posted to Flickr by woodleywonderworks at https://www.flickr.com/photos/73645804@N00/2458666314. It was reviewed on 6 December 2012 by FlickreviewR and was confirmed to be licensed under the terms of the cc-by-2.0. This page was last edited on 19 January 2018, at 04:09.